AQUESTES SÓN LES ACTIVITATS QUE VAM FER DURANT LA SETMANA CULTURAL PER CONÈIXER I ACOSTAR-NOS A LA REALITAT NICARAGÜENSE. I ESTABLIR EL PRIMER PAS D'AQUEST AGERMANAMENT, D'UNA LLARGA I BONICA AMISTAT. DURANT ELS DIES DEL 3 AL 5 DE NOVEMBRE VAM ESTAR CELEBRANT A L'ESCOLA LA SETMANA CULTURAL DEDICADA A NICARAGUA. DURANT AQUEST ESTIU LA MAITE, MESTRA DE LES OQUES, VA ESTAR A NICARAGUA FENT DE VOLUNTÀRIA EN AQUESTA ESCOLA. I AQUESTS DIES ENS HA EXPLICAT MOLTES COSES SOBRE L'ESCOLA, ELS NENS I EL SEU BARRI I PAÍS. EN DIFERENTS ENTRADES US ENSENYAREM TOT EL QUE HEM FET A L'ESCOLA. HEM CELEBRAT A L'ESCOLA COM CADA ANY LA CASTANYADA. HA VINGUT LA MARIA CASTANYERA I ENS HA DUT CASTANYES TORRADES BEN BONES! I LI HEM BALLAT LA CANÇÓ DE LA CASTANYERA I LA RUMBA DEL BONIATO, TURURURUUUU!!! I TAMBÉ HEM FET ELS PANELLETS, PRIMER VAM ESTAR FENT LA MASSA I A L'ENDEMÀ LES BOLETES! ENS VAN SORTIR BEN BONS! SOM UNS EXCEL·LENTS PASTISSERS!! AQUESTES SÓN UNES FOTOS DE LES OQUES I CONILLS FENT UNES FEINES DE GRAFISME QUE ELS ANIRAN MOLT BÉ PER APRENDRE A ESCRIURE EN UN FUTUR! COM JA SABEU ENGUANY TAMBÉ ENS ACOMPANYA LA LLIBRETA VIATGERA I LES NOVES MASCOTES DE LA CLASSE: L'OCA I EL CONILL, QUE VIATGEN A CASA DE CADA NEN/A PER CONÈIXER MÉS ASPECTES DE LA SEVA VIDA DIÀRIA. LA NOVETAT D'AQUEST ANY ÉS QUE FEM DE PETITS REPORTERS, ÉS A DIR HEM D'EXPLICAR ALGUNA NOTÍCIA SOBRE EL BARRI, SOBRE LA FAMÍLIA, SOBRE CASA NOSTRA... I CADA COP QUE PORTEM LA LLIBRETA I LA MASCOTA A LA CLASSE L'HEM D'EXPLICAR. I LA VERITAT ÉS QUE CADA COP ENS FA MENYS VERGONYA I HO FEM MOLT I MOLT BÉ! TAMBÉ COM ENS HEM FET UNA MICA MÉS GRANS, QUAN ACABEM D'EXPLICAR EL QUE HEM FET DURANT AQUELLS DIES ELS NOSTRES COMPANYS ENS FAN PREGUNTES MÉS DIFÍCILS. A VEGADES ENS COSTA UNA MICA PENSAR LES PREGUNTES PERÒ ENS ENSORTIM PROU BÉ! 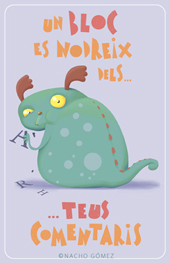 ESTEM MOLT IL·LUSSIONATS DE PODER TENIR DE NOU LA LLIBRETA. CADA COP QUE LA NOSTRA MESTRA ESTÀ A PUNT DE DIR A QUI LI TOCARÀ ENDUR-SE LA LLIBRETA, ENS POSEM MOLT NERVIOSOS PER SABER SI SEREM UN DE NOSALTRES ELS AFORTUNATS! LES NOSTRES MESTRES ESTÁN MOLT CONTENTES DE LA COL·LABORACIÓ I DE L'AJUDA DE TOTS ELS PARES EN AQUEST PROJECTE! MOLTES GRÀCIES! !